The weather is finally warm, and the fear of stepping outside has vanished from our conscious. It is finally camping season. Is there anything better than being immersed in the great outdoors? For those who camp, you fully enjoy the sunshine, the forest scenery and of course the campfire stories. But what I’m sure you don’t enjoy is the garbage that is often left behind at campsites. Why is it that people enjoy spending time outside, but don’t take care of our environment? Items commonly left behind at campsites include tinfoil, bottles, and cans. All of these items can be taken back home with you and be recycled. If they are left in the environment an aluminium can, for example, can take 200 to 500 years to degrade. There are many problems faced when considering waste free camping, and can often feel overwhelming. Here we discuss common problems with easy solutions. Depending on where you are camping the amount of stuff you can bring may become a factor in your packing. If you are backpacking, or going to a drive up campsite there are still ways to go waste free for both. Food is normally the hardest thing to plan when going camping. We’ve broken down ways to minimize waste when meal planning below. of days you are away. Don’t forget snacks! planned ahead of time? For example pancake mix or anything with different dry ingredients ( eg. flour, baking soda, baking powder) can be pre-mixed ahead of time in containers or glass jars. Snacks like granola bars or trail mix can always be made at home to avoid packaging that isn’t accepted in your local blue box program. 2. Avoid ziplock bags. Use tinfoil instead, tinfoil is made of aluminium and can be infinitely recycled (as long as it stays clean). Tinfoil also can be reduced down, so it takes up less space in your car or backpack when you are leaving. Other great ways to bring food and snacks include reusable containers and jars. There are also reusable containers which can collapse after use which may be handy for backpacking. While camping, weight matters. Opt for lightweight plastic containers. 3. Be a conscious consumer when buying food for your trip, think of items that can be purchased with less or no packaging. For example, Bulkbarn is a great way to #PackWithNoPackaging. 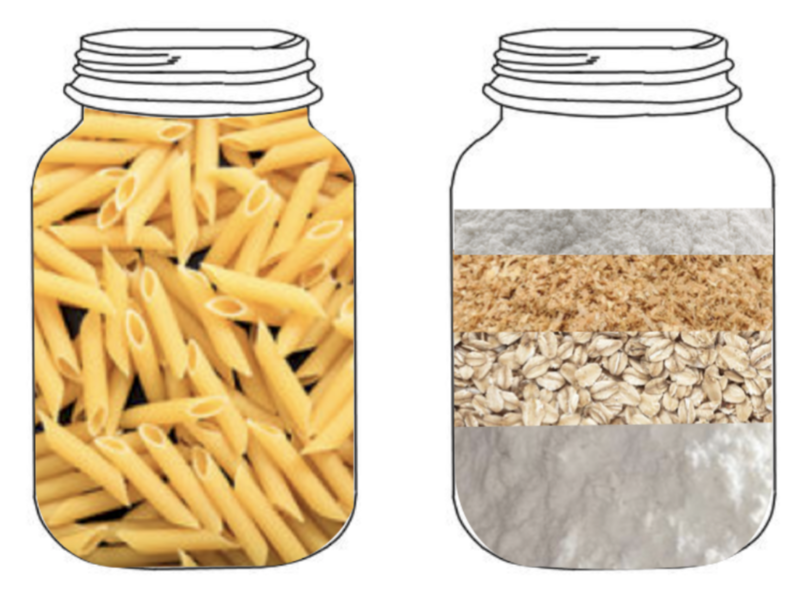 You can bring your own containers from home and get everything you need – snacks, pasta, pancake mix and more. r jugs when possible with reusable cups or water bottles is the best solution. If alcoholic beverages are also included on your packing list, bring cans. Cans can be crushed down, which take up less space and there is no fear of broken glass either in your packs, or at the campsite. When camping, there are certain essentials that you always make sure you have such as a tent, sleeping bag, and cookware. However for those of you that haven’t camped before, acquiring this gear can be expensive. For first time campers, before you spend the money make sure you actually like camping. Head to a nearby thrift store to find discount items, along with helping the planet by keeping these camping essential out of landfills, not to mention the amount of resources it takes to make products from raw materials. Renting equipment is also a great way of getting gear at a lower price. Another important consideration when camping is cookware. Bringing pots and pans are heavy but if have ones that fit inside each other and are smaller in size, it’s a great way to conserve space. Try to avoid single use plastics and styrofoam plates. Remember, if styrofoam is dirty, it won’t be recycled. Try to bring compostable plates, or ones that can be washed and reused. Bring reusable cutlery and plates, this will reduce the amount of waste you bring out of the campsite with you. These easy changes you make when camping, are also easy to apply to your everyday activities. Being aware is the easiest way to show you care. When camping this summer, or any activity that is outside, follow the #NoWasteNoTrace rule. If you create the waste, clean it up and dispose of it responsibly. Getting out into nature is a great way to reconnect and remind ourselves why it is important to be environmentally conscious.